The dating service claims to serve mainly white people. In answer to the question of why the service only wants to serve white people, on its website the company asks “why not”? The site goes on, saying, “There are various dating websites that promote and cater to just about every origin, race, religion and lifestyle out there. 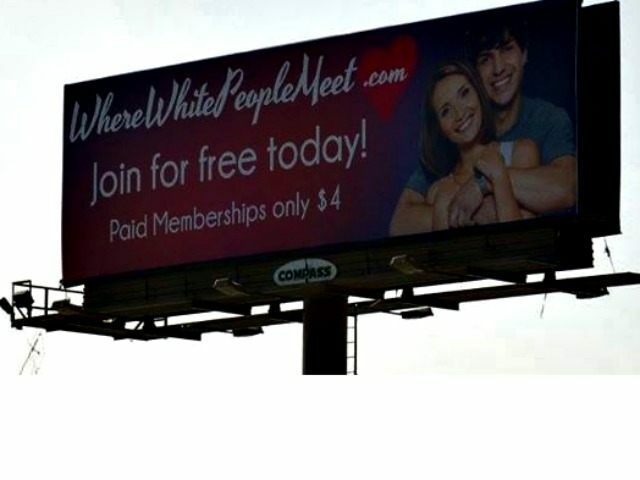 So again, why not “Where White People Meet.Com”? Here at Where White People Meet.Com we believe in the concept that all people have the right to ‘Life, Liberty and the Pursuit of Happiness.’ We also believe that finding your perfect partner, your soul mate is one of the best ways, as humans, to obtain happiness. Furthermore we believe that all men are created equal (the word men stands for a species, not gender). Not everyone seems to say “why not” to the service. Salt Lake City’s Fox 13 spoke to several residents about the billboard. “I just don’t think it’s the way to teach our kids to love all when you see billboards like that,” Kim Gilbert said. “I just feel we should be past that whole mindset of staying within our own race and segregation pretty much,” Dessau told Fox. On the other hand, resident Sarah Christison wasn’t as negative about the concept. “I don’t think it’s any different than other sites for specific races, religions or ages,” she said.